Ugh, I apologize in advance for putting that song in your head, but I guess everyone's day isn't complete without a Spice Girls earworm. If you're on Twitter and follow publishing people at all, you'll notice that just about everyone and their mother is going to BEA--Book Expo America, the largest publishing trade show in America and one of the biggest book events in the world. And I am super jealous of everyone who's going. See, I've always wanted to go to BEA. Even before I was published, I wanted to go as a fangirl, but couldn't afford it. Now that I am published, I've wanted to go as an author, but the timing of my books' releases haven't been good for it. I have a book that is very close to my heart, and that I want to make it out into the world. I've been writing and revising it between my other contracted books (I started working on it before I finished Shades of Earth), so it's been slower that normal, but I really love this book. 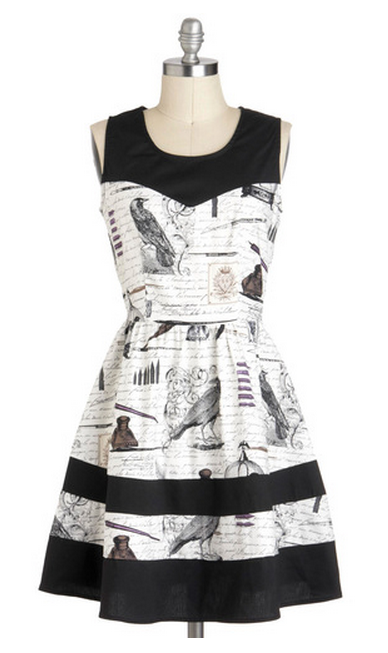 I recently saw a dress on ModCloth that was perfect for this book. This one. 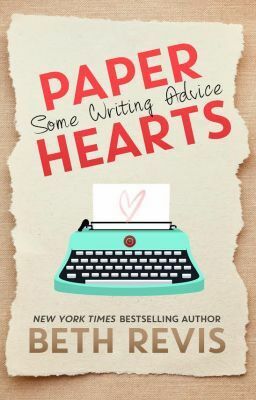 Everything about it--words, pens, birds--was perfect for this book of my heart. The one that I'm currently revising--again--and hope, hope, hope that it sells. Which means it's not sold yet. And I've been doing this long enough to know that it might not sell at all. But...I could see myself holding a launch party for that book wearing that dress. When I shut my eyes, I imagined how it would be to sign a book in that dress, and have the reader notice the tiny details in the cloth and realize that the dress really was that perfect. But...I hadn't sold the book yet. I shouldn't buy that expensive of a dress for an imaginary launch party for a book that had not sold yet. It was sort of ridiculous. I decided that I needed that dress. I needed to believe that I would have this launch party, that it would happen for me, for the book. I needed to believe that one day I would wear that dress and a reader would notice the details and connect them to this book. That a reader would read the book. That's why I bought it. For the chance of this dream coming true. It's hanging in my closet now. I'm not going to wear yet. But I will. One day. Hopefully soon. I will iron the wrinkles out, and I will whisper to the cloth, "I told you so." Seeing everyone tweeting about BEA right now of course makes me a little jealous. That's a dream I would like to fulfill, one that probably won't happen any time soon. But rather than stew in my own envious green juices, I decide what I'd do is make a list of things that I hope will one day happen. I don't want to seem ungrateful! My biggest dream--to have a book published--has already come true, and with it, so many other dreams that I hardly believed possible--listing, reviews in Kirkus and PW, seeing the book on a shelf, being asked to sign, getting fan mail and fan art. That stuff is amazing and I wouldn't trade it for the world. If nothing else happens, those memories will forever be a part of my happiest place. 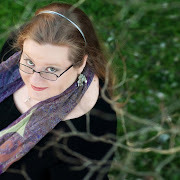 Attend BEA as an author: I've just talked about this one, but it's one I definitely want. BEA has been this glimmering dream of mine, and I really want to walk into the Javits Center as an author and do a signing or a panel. Other events that I really want to go to as an author: Comic Con in San Diego and the Texas Library Association Conference (TLA). Do a signing in the Philippines: I hear from readers in the Philippines about every other day, and they seem like voraciously avid readers, and I would love to come and meet them! I've never been to that side of the world before, but it seems so awesome. 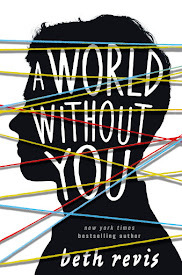 Other countries that I really want to visit for book signings: Germany, Spain, Brazil, and basically everywhere. I love to travel. Merch: This likely would never happen unless a movie is made, but I've always sort of wanted to see some kind of merchandise based on something in my books. A Lego kit of Godspeed? A FunPop vinyl doll? And the biggest one of all: A lifetime career in writing and a legacy of books. This is one that I will never see personally. But...I want to always be writing. This is my dream job, and even now, it's still a dream. And...I'd like it if, long after I'm gone, I have an oeuvre out there in the world, and that far in the future, some kid will pick up a copy of one of my books and enter my world again. This is the closest thing you can get to immortality on Earth. Some of these dreams I can control. If I save my money, I can attend BEA or do an international signing on my own. Some authors have even run successful Kickstarters or other campaigns to turn their books into film or launch merch lines. And I will certainly not quit writing as long as I am able. I'll do all I can to give Fate a chance to make these dreams come true. That's it--those are my current biggest dreams for my profession. What are yours? Find all the secret symbols hidden in these portraits of Amy & Elder! 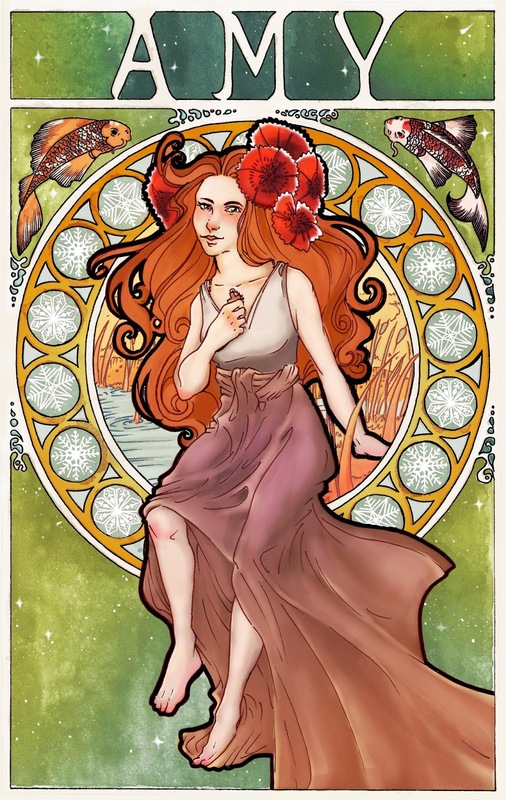 As I mentioned in my previous post, I wanted to find an artist who could make a Mucha-style portrait of my characters. First, I just really love that style--but second, I think it lends itself to discovering characters in a particularly wonderful way. See, every little detail in a Mucha portrait is symbolic, and when we're talking about characters, a Mucha-style portrait of one will show hidden meanings. I'm so happy that Christine Tyler was able to capture Amy and Elder so perfectly! And within each image, there is so much hidden meaning. Take a look for yourself, and see if you can see all the symbols within each image. Answers below! Ladies first...what symbols can you see in Amy's portrait? Click for an even larger image! And now for Elder--do you see all the symbols? Ready? Think you see all the secret symbols hidden in the image? I know that even I didn't catch all the amazing details Christine included in the portraits. Check below! The flowers in her hair are amaryllises. In my very first draft of of Across the Universe, Amy's name was short for Amaryllis, and she was frozen with a flower bulb. But that was a touch too complicated for the story, so I cut it. The fish in the corners symbolize Harley's nickname for Amy, Little Fish. The pond in the background of the story is the pond hiding the portal to escape the ship. Amy's background is green to represent phydus, likewise the edges of the circle have little splashes to represent the water laced with phydus. In the icons of the circle around them are snowflakes, to represent how cold and lonely Amy was in cryogenic freezing. Amy's holding a cross, to show her faith. Elder is wearing the Eldest Robe, which in the book is described as having a field on the bottom fading to stars at the top. Christine went a step further and made the stars constellationally correct-- at Elder's right arm is the constellation Orion, and at his left arm is the constellation Scorpius, which chases Orion across the sky and, according to mythology, is Orion's greatest foe. This was such an amazing detail that Christine added on her own, and is just perfect! In the corner of Elder's image are rabbits, to symbolize the rabbit farms on the ship, which are featured not just in the books but are a key part of the novella, "As They Slip Away." In the edges of the large circle, the image is breaking and shattering. Here's Christine's reasoning, directly from her: "Elder's is breaking/shattering because to me, his biggest moment of change was when the explosion happened on the [Eldest level,] and he had to choose to close the doors off for the great good. He also 'breaks off' from the line of Eldest." And don't forget that in the background of both images are stars, which is the only level of symbolism I consciously added to the story. Stars, much like in Dante's Inferno, equal hope. And on a personal note, I love that Christine took so much care to show Elder's ethnicity, and that he's not white, with features influenced by South Asian and Native American physiology. There's one more secret to these images, and it's this: these aren't the only things Christine made for me (and you)! I'm still working with my agent and publisher on this, but hopefully you'll see some brand new characters...soon! I adore the artwork on Alphonse Mucha. This art nouveau painter is probably best known for his highly stylized portraits that feature strong lines, symbolic icons, and beautiful colors. 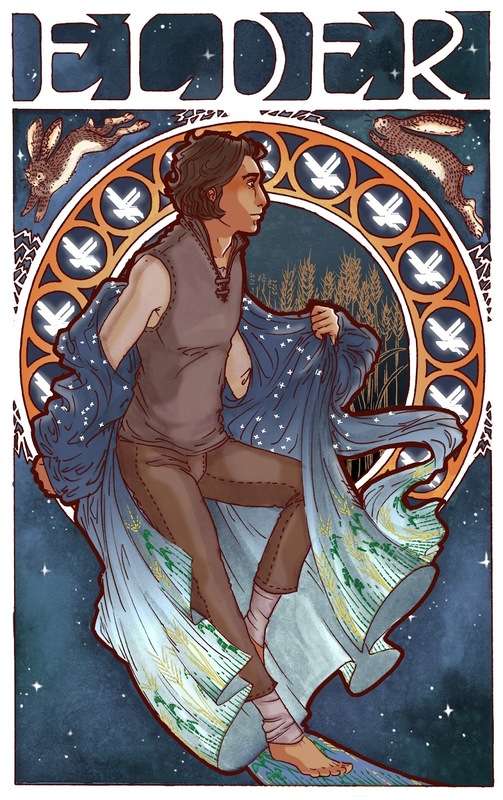 Amy and Elder's story takes place in the far future--which may make my desire to see them in a Mucha style a bit odd. But I love the juxtaposition of old and new, and the plethora of details that can be contained in one image. To create portraits of Amy and Elder, I reached out online to the very talented Christine Tyler. She worked tirelessly to see the vision through to completion, and the results are, simply, breathtakingly beautiful. I am in utter awe of the art Christine made come to life, and cannot say enough how happy I am that these images exist in the world. My favorite thing about Mucha's art is the attention to detail, and I knew that Christine wouldn't disappoint in that regard. Every little thing in these images has a deeply symbolic meaning. I'll be doing a post later about her art, and detailing all the brilliant symbols she included. But first: as many of you know, I'm currently at the RT Booklovers Convention in New Orleans (click for my full schedule). 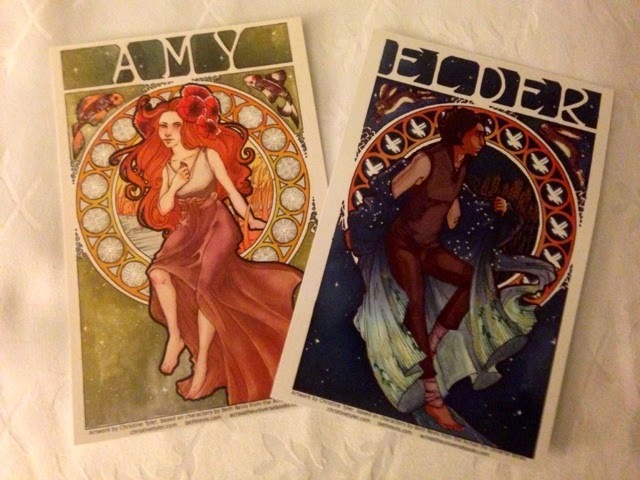 To celebrate winning the RT 2014 YA Futuristic Book of the Year award for Shades of Earth, I've made art cards of Christine's portrait of Amy and Elder. I have a couple hundred with me--and to get one, all you have to do is find me at one of my panels or at my signing or at the Teen Day Party, and I will give you one! Check back here after RT for fuller versions of Amy and Elder. And while I can't reveal everything I've been working on with Christine, I'll simply say that this is only half of the art she's done for me, and we still have two more very special prints to reveal in the (hopefully near) future! 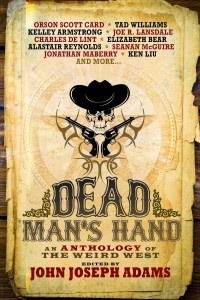 I'm thrilled to be a part of Dead Man's Hand: An Anthology of the Weird West, edited by John Joseph Adams. I recently got my copy in the mail and saw so many old favorites in the table of contents...Charles de Lint, Kelley Armstrong, Seanan McGuire. And the anthology has some new authors whose works I simply cannot wait to get into! My short story is called "The Man with No Heart," and I'm really happy with the way it turned out. Here's some fun facts! A saloon girl and bad guy and a white hat!